If you were worried about being a small time investor, there's some good news for you. Now with only $5,000 and a crowdfunding platform, private investors can own a stake in Lower Manhattan's 3 World Trade Center, reports the New York Daily News. Fundrise, a real estate crowdfunding and investment platform, purchased a $5 million share in tax-exempt bonds to help finance the office building, which will stand 80-stories tall. "We are proud to be able to give more people a chance to invest in this important, iconic asset," Dan Miller, co-founder and president of Fundrise, told the Daily News. 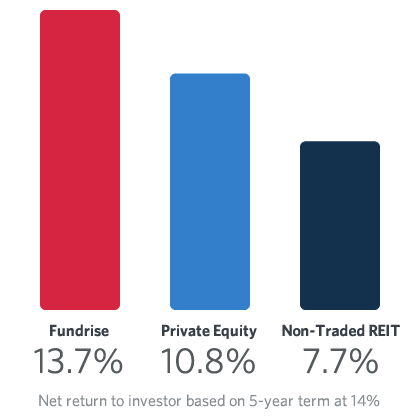 Fundrise is projecting an annual return of 5 percent on the five-year investment. Investors would not be exempt from SEC requirements. Real estate crowdfunding is gaining traction, especially in New York City. A similar endeavor is taking place just a block away from the World Trade Center site for a new hotel. 3 World Trade Center will be the third-tallest building on the World Trade Center site and will include 2.5 million square feet of Class A office space. The Class 1 bonds, held by Fundrise, are senior secured with a 5% tax-free return. Lower fees means better returns. Our revolutionary direct approach to sourcing investments uses technology to reduce the number of traditional middlemen, cutting down on overall fees.